Do you remember the sweet woodland animal prints I was crushing on from the Fat Quarter Shop a few weeks ago? Well, my client liked them a lot, too, so I purchased them and knew that it would be the first project to tackle when I returned home from QuiltCon. I paired the cute prints with some solids – the Kona Oyster for resting space for the eyes. Following my Owl City Baby Quilt Tutorial, I took my time cutting out and preparing to piece the quilt top. The green (Kona Leprechaun) around the edge of the layout will actually become the binding. I spent an hour prepping all the fabric. I was able to piece the top in 1.5 hours. Not bad for 2.5 hours of time back in my sewing room this week. I hope I have a finish to share soon! Hi again Jetgirl… Yvonne, I hope this finds you well. I like your quilt, the only question is did thru not have a big design one, or am animal to applique? Love the colors. Hang there! New site ’16. Don’t you hate auto correct, I’m a spelling buff and can’t get a machine to print what I type. This is a nice little hit of colour for the end of winter. Love it. What a delightful baby quilt! The simplicity is perfect, and the figures are showcased by the white with the colors giving rhythm like piano keys… I can hear the happy woodland sounds! Great design! You didn’t waste any time getting back in the groove after Quiltcom! Looking forward to seeing your quilting! 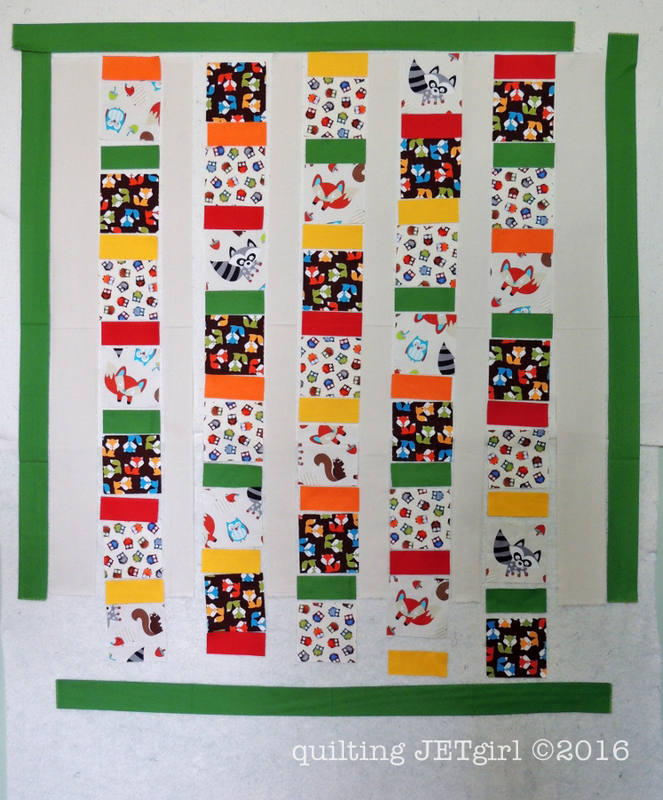 It’s the perfect little quilt to get you back in the sewing room after QuiltCon! 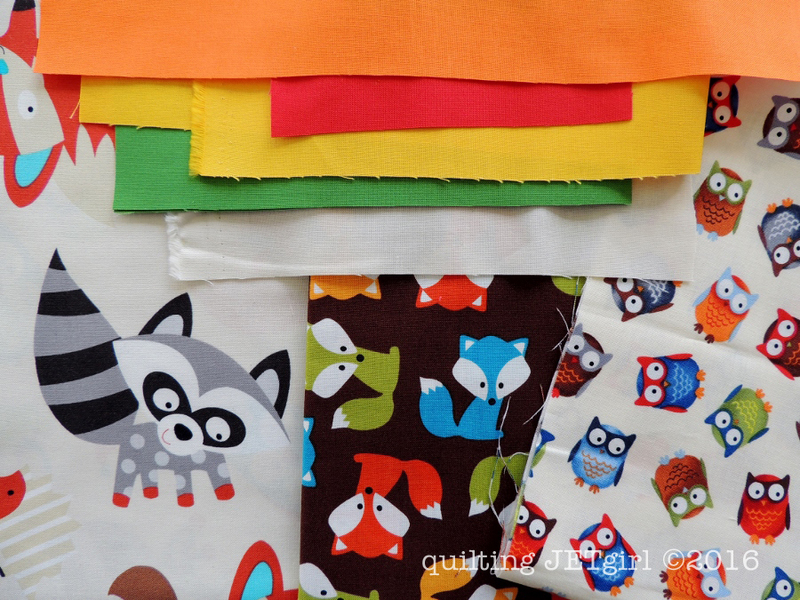 Adorable fabric…so different from your last baby quilt!! Oh man those critters are cute! Great choice of solids to pair with it. 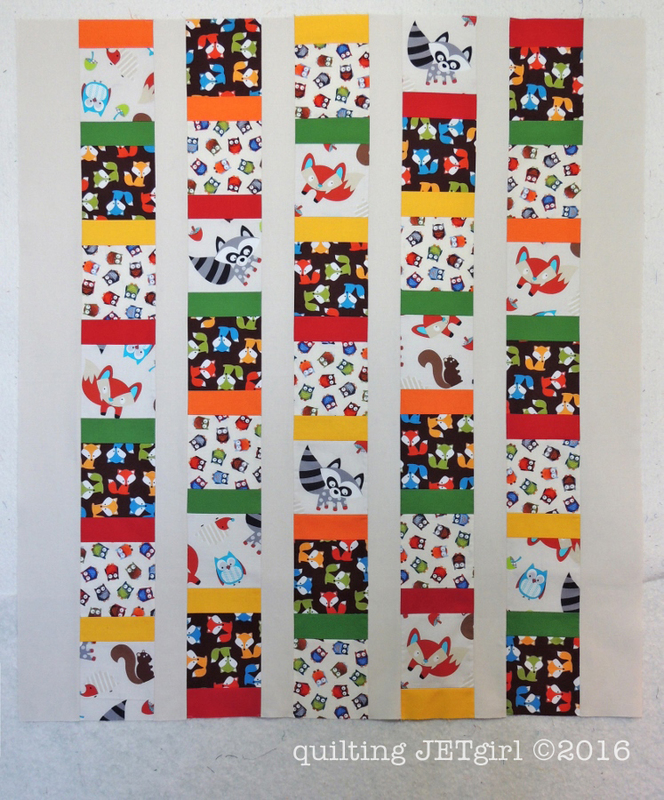 It’s such a good baby quilt with high contrast, patterns, and animals! Who can resist Ann Kelle’s wee woodland critters? Not me. Those foxes have a home in my stash… in two colour pathways. Lovin’ the Leprechaun binding too! Darling! I love how you selected a few animal prints with different backgrounds and sizes of prints. So cute! Great lights, mediums and darks and variation in scale! Very nice baby quilt. Love your fabric choices. Good Morning Yvonne! This is an adorable baby quilt! The special animal fabrics are highlighted perfectly with the solids. Plus, having a simple design with a baby quilt sometimes is the absolute perfect way to showcase the fabrics and the quilting! I can not wait to see the quilting you decide to do! Thank you for sharing and have a fantastic day creating! So cute! I like how you fussy cut the critters to feature them. Your client is sure to love this quilt! That fabric is just gorgeous!!! Isn’t it great once everything is cut out? Very cute! I like how you were able to fussy cut some of the prints. I have never used oyster from Kona, it looks like a really great neutral background color. What a great way to utilize a novelty print. I can’t wait to see how you quilt it because knowing you, it will be amazing! Love how they work with the bright solids, very effective.